Legacy Fighting Alliance will be back in Missouri on June 8. The Branson Convention Center is becoming a familiar stop for the nationally touring promotion which will be hosting its 13th event this calendar year. 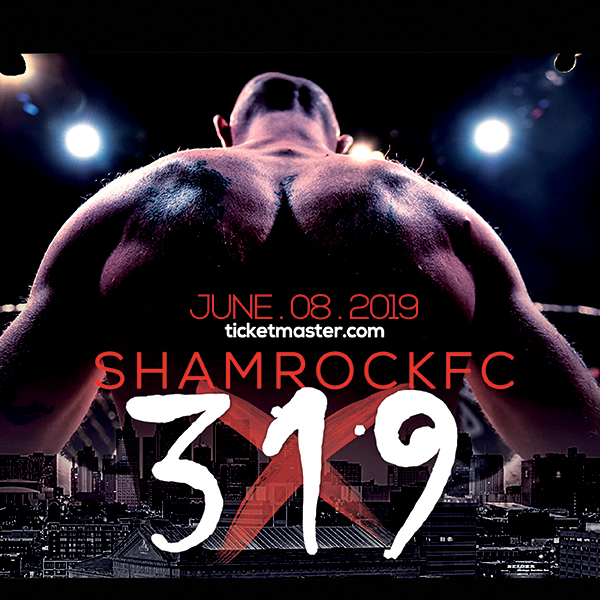 Fight fans in Branson will remember back to September when Kyle Noblitt nabbed a first-round guillotine over Antonio Branjao in the main event. Headlining the upcoming Branson event will be Derrick Krantz taking on Kassius Kayne in a welterweight match-up with nearly 50 combined pro fights between the two. 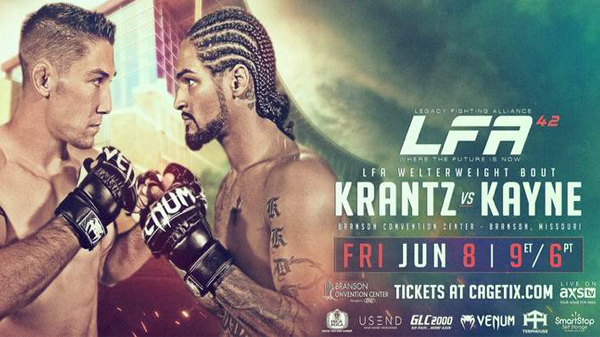 Krantz (21-10) has fought the majority of his recent fights for LFA winning seven of his last nine bouts coming into his match-up with Kayne. Nebraska's Kayne (12-4) is a veteran of the big fights having competed almost entirely for RFA and Victory FC before getting signed by LFA last year. Kayne has won three out of his last four. The fight card for LFA 42 is littered with familiar names from the St. Louis fight scene including a trio from St. Charles MMA, and potentially one of Missouri's best-kept secrets, Chel Erwin-Davis. Erwin-Davis (5-1) has taken out some of the best welterweights St. Louis has to offer with wins over Adam Meredith, Adam Cella, and pro boxer and kickboxer Kevin Engel. Despite two of those wins coming for Bellator, the LFA 42 fight, currently slated as the co-main event, will be his biggest opportunity to date. Facing Erwin-Davis is 8-1 Jaleel Willis, a hard-punching welterweight out of Memphis, Tennessee. After winning eight in a row, Willis suffered the first loss of his career, dropping a decision in his LFA debut. SCMMA's Charles Johnson was on the last Branson LFA and is back to take on AJ Kimzey. "It feels amazing, it feels familiar," Johnson said. "I tell everyone that being a pro is about being confident and comfortable. The more confident you are, the more comfortable you are. The more comfortable you are, the more confident you are, and that comes from putting in the work. In this it's a familiar venue, familiar promotion, you know what you're going to get when you get there, so I'm excited." Johnson (6-1) is coming off the first loss of his professional career in March dropping a decision to Sean Santella in Pennsylvania. "I was ready to fight again within a week," Johnson said. "If you asked anyone, I didn't really lose that fight. I'm ready to get back in there. I got an itch. Things went how they went, I went back and looked at it and saw opportunities where I could have won the fight. All in all, I'm going to be ready go after that one." Kimzey is 3-1 coming off a loss in January to Steven Graham, having fought the entirety of his pro career for southwest Missouri's Walkout FC. "I don't know much about the guy," Johnson said. "I've seen his opponents record, and he hasn't fought too many tough guys, and I've seen the promotions he's fought for. I'm expecting a guy who's coming out for the opportunity of his lifetime and look the best he has, but I thoroughly believe in everything I've been doing, and there's nobody around here that can touch me." Johnson's teammate Julius Anglickas is back in action after a sizable break in action. Anglickas last competed in December 2016 where he defeated Mike Doss in the third round via TKO. "I'm really excited, it's been a real long, long time," Anglickas said. "I always think I'm going to have some rust on me, but I know that's not going to be the case once I get in there. I thought the same before a boxing match I had, but I performed perfectly. I train hard every day, I spar with top guys, I roll with top guys. I know the second I get in there it's going to be like any other practice." Anglickas hopes to show off an improved ground game and a more evolved overall package, something he's focused heavily on during his layoff. Facing Anglickas is undefeated light heavyweight Erick Murray out of Nebraska. Murray has won all three of his fights by stoppage including a second-round leglock victory this past March, an impressive showing that earned him the spot on the LFA main card. "He's a tough guy, he's 3-0," Anglickas said. "I feel it's going to go my way, I'm going to be stronger, but you never know how it's going to go. You can have all the confidence in the world, but in reality, I'm not going to know how it's going to go until I'm in it. I do see myself winning no matter what, but we all say that. If he believes he's going to win and I believe I'm going to win, one of us is going to be wrong. The moment of truth will be during the fight." Rounding out the St. Charles trio and kicking off the televised main card is Lucas Clay. Clay is on a roll after a troubled early part of his career that was riddled by last minute cancellations due to the difficulty of finding opponents. "I feel so blessed," Clay said. "For a while, I just thought that was how it was going to be. I just thought I could look forward to people pulling out because it was normal. It was like every single fight, nobody wanted to fight me, and now I'm going to be on tv." Clay created a bit of a buzz with a recent win on FloCombat via the seldom seen "buggy" choke. "The video I saw had like 50,000 views, so I've definitely gained some popularity from it," Clay said. "I'm just doing what everyone who knows me for, I just go for these crazy moves. I have this theory that no position is a bad position and that I can finish from everywhere. Now people know that I can do that because I submitted a brown belt with a move that's not even a move." Facing Mike Breeden, Clay (3-0) hopes to keep the train rolling and make the most of his chances. "This opportunity feels like destiny." Clay said. "This is what people told me would happen along the journey. They also mentioned that failure is part of the journey so no matter what happens I'll be satisfied. I win like a man, and I lose like a man, but I really want to entertain because that's my job, I'm an entertainer at the end of the day. This is a job to me and is going to be my livelihood, and I have full faith in that." One prelim bout that should surely entertain the fans is a match-up between Ty Flores and Marco Hutch. Hutch, "The Afro Samurai," is one of the best fighters to come out of the Branson/Southwest Missouri region and combines precise, technical striking with a solid ground game. Flores is big, tough, and good on the ground, and should be able to hang with Hutch should the fight turn into a submission battle. Flores should have the edge in wrestling. This one should be fun to watch as you have to put Flores away to get him to stop coming at you, and that won't be an easy task. Also back on the card is local favorite Katie "Red Dragon" Collins. Collins hopes to turn the ship around three out of her last four, but being back home in front of a friendly crowd should help get her motivated. Collins takes on Jamielene Nievera who's won her last two including a 46-second submission in March over Devon Holmes.